Up until now, most Architects, Designers and Interior Designers have avoided choosing and specifying paint in 3D BIM projects – and prefer to simply use mood boards. This is understandable, as other 3D BIM software are not design tools – and are not about communicating design intent in a 3D format. Physical mood boards and colour samples are valuable tools for Architects and Designers, but they are disconnected from the BIM model and 2D plans, which can lead to error. More importantly, clients find them very difficult to understand. How can they be expected to see the bigger picture in an abstract form? Clients need to be able to see colour in context – and there is no better way than in 3D! Another big problem arises when trying to communicate paint choices to Builders and Trades. Explaining your color choices with 2D plans or text can easily lead to misinterpretation and error. This costs everyone. Paint can have a surprising impact on the price of a project. 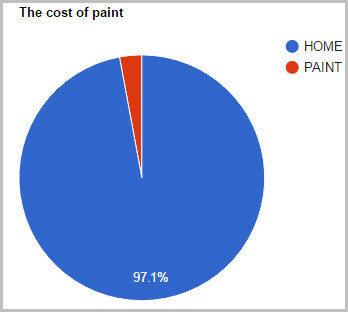 For a bespoke home, the cost of paint typically ranges between 2.5% to 3%. Due to the traditional communication methods (text format, 2D plans, etc) it is common that errors and oversights are made in cost estimates, as well as onsite. The cost and time associated with painting error can be significant – and it is almost always tied back to communication error. Get it right and the price is insignificant. Get it wrong and the price can be significant. PlusSpec for SketchUp is the ultimate design and communication software – and with the addition of our new Paint Tool, our users will be able to design, specify and communicate color choices in BIM, like never before. And every surface that you paint will be automatically quantified and estimated! Architects, Designers and Interior Designers will actually be able to design with color in 3D, and then clearly communicate their choices to their Clients, Estimators and Builders. Estimators will not miss allowing for paint when creating cost estimates. Builders will be able to explain the paint selections to their Painters onsite by viewing the 3D model on a laptop, phone or tablet. Clients (and everyone in the Project Team) will be able to have a virtual walk-through in 3D, room by room – and actually understand the color choices. You NEED to communicate color and finishes in a way that everyone understands! When will the Paint Tool be released? You won’t have to wait long! This amazing new tool will be made available in our next big update, which is scheduled for release within the next couple of weeks (if not before)!